April 9, 2013, 12:54 p.m.
By Justin Ellis @JustinNXT April 9, 2013, 12:54 p.m.
It’s been 45 years since Martin Luther King, Jr.’s murder was on the front pages of newspapers around the country. For The Commercial Appeal in Memphis, the story was a local one; King was assassinated while visiting the city to lend his support to the city’s sanitation workers who were on strike to protest their working conditions. More than four decades later, the paper wanted to take a different approach to retelling the story of what happened to King. What they produced is 6:01, a narrative account of King’s final 32 hours in Memphis, wrapped in a custom interactive reading experience. Assembled through a combination of interviews, public records, published accounts, and other documents, the story builds a sense of pace and suspense from the moment King and his entourage land in Memphis to the moment James Earl Ray pulls the trigger and takes King’s life. The story takes on a cinematic feel thanks to the immersive, magazine-like design, which includes ample photography from the period as well as video interviews and a timeline. The process started last fall, as reporter Marc Perrusquia began work on the story. Perrusquia has been with the Appeal for 24 years and has spent a lot of that time covering aspects of King’s life and death, including a prison interview with James Earl Ray in the 1990s. Last year, Perrusquia had reported a series of stories on Ernest Withers — the civil rights photographer who turned out to be an FBI informant — that was helped along by the release of previously sealed FBI files. With that case still in the back of his head, Perrusquia said he wanted write about King from a new perspective. “We wanted to go back to as many of the original people who are surviving and the original records to just kind of walk through the day,” Perrusquia said. So he set out to create a “day in the life” tale of one of the most-written about people in American history — which might seem like a futile task. But Perrusquia said the story was in the smaller details of King’s last 32 hours, not necessarily the scope. Instead of a Rashomon effect, we find a story that melds the remembrances of Kings contemporaries who are still alive with the historical record. The recent explosion in online feature design has both emboldened other media companies to experiment and also given them a guide. “The New York Times did the avalanche piece and people are almost starting to refer to pieces like this as ‘snowfalling,'” said Andre Howell, senior director of product design and development for Scripps. The central conceit the designers wanted to use was time, as the story sits in a fixed 36-hour universe that counts down to 6:01 p.m. of the evening King was shot. Howell said they wanted the design to help propel readers through the story as a visual accompaniment for the pacing set by Perrusquia’s writing. “It holds you at the cusp,” he said. “You’re reading and he’s only got 20 hours to live, and even though you know what happens at the end of those 20 hours, it gives users the anticipation” to continue reading, he said. Howell said they knew they wanted to use a long, continuous scroll to drive the piece because it gives the reader a sense of movement, but allows designers the ability to drop in interactive or graphical elements to help in the storytelling. Building the custom design took time, and Howell said they were working on code until just before the story went live on April 3. Graham said he emailed the Appeal newsroom after 6:01 was published to ask for story ideas that could warrant similar treatment. But we could also expect similar interactive features from other Scripps newspapers, said Bruce McLean, senior director of digital operations for Scripps. “One of the things we’ve been talking about a long time is the ability to create really great digital journalism projects based on local stories,” McLean said. Like many newspaper chains, Scripps has tried to find cost savings in consolidating operations in regional facilities. McLean said the centralized digital team is staffed by many of the developers who previously worked at various Scripps papers. While that shift changes the process of conceiving and building homegrown interactives for the papers, McLean thinks the digital hub will result in the ability to do more and more ambitious projects in the future. A centralized design and development shop means Scripps will not only be able to scale projects like 6:01, but they can also distribute them to all of the company’s properties to reach the widest audience possible, McLean said. POSTED April 9, 2013, 12:54 p.m.
Ellis, Justin. "Design isn’t just for the big guys: In Memphis, the Commercial Appeal retells MLK’s last 32 hours." Nieman Journalism Lab. Nieman Foundation for Journalism at Harvard, 9 Apr. 2013. Web. 19 Apr. 2019. Ellis, Justin. "Design isn’t just for the big guys: In Memphis, the Commercial Appeal retells MLK’s last 32 hours." Nieman Journalism Lab. Last modified April 9, 2013. 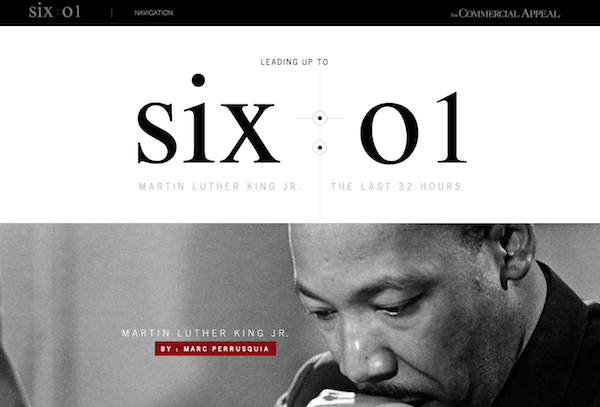 Accessed April 19, 2019. https://www.niemanlab.org/2013/04/design-isnt-just-for-the-big-guys-in-memphis-the-commercial-appeal-retells-mlks-last-32-hours/.